Mr Sisodia has lived off this tiny 1.6-hectare patch of farmland for generations. So when Reliance Natural Resources Ltd (RNRL), a powerful business conglomerate promoted by the billionaire tycoon Anil Ambani, offered to pay him 3 million rupees for his land – an astronomical sum for a peasant who earns less than 10 per cent of that amount a year – he resisted. In 2006, the government allotted RNRL 10,000ha of richly fertile alluvial land from seven villages, including Bajheda Khurd, in Ghaziabad district in northern India, to build a 7,480-megawatt gas-fired thermal power plant, touted as the world’s largest. But this move was bitterly opposed by 30,000 farmers who would be displaced. The farmers, who own the land, say it was forcibly acquired against their will. Last month, RNRL suffered a massive setback when a court ruled that farmers from the region were entitled to get their land back. Such disputes over land acquisition have jeopardized hundreds of industrial projects around the country. As India’s economy surges, the country is whetting a large appetite for industrialization. With cities congested, the only free land available is fertile farm land in rural India. In a country where more than half of the 1.2 billion population lives off farming, the government faces a major dilemma of how to divert this land to industries. Since 2006, the Indian government has approved the creation of 568 special economic zones – Chinese-style, tax-free industrial enclaves to promote trade and exports – but less than half have successfully taken off. Land acquisition procedures for industrial projects are threatening to endanger investments worth US$100 billion all over the country, the Associated Chambers of Commerce and Industry of India says. In many instances the transfer of land between farmers and corporations has occurred without conflict, but a large number of projects have run into trouble. In 2008, TATA Motors announced it was suspending construction of its Nano factory over a sprawling 405ha of farmland in Singur, in the eastern state of West Bengal, dogged by violent farmer protests that it was unable to quell. TATA wanted to use the land to build the world’s cheapest car, the $2,500 pint-sized four wheel drive Nano. The violent backlash compelled them to shift the entire project to the western state of Gujarat. Arcelor Mittal is keen to set up steel units over 2,850ha of land in the iron-rich tribal areas of Jharkhand and Orissa, but faces an inordinate delay in acquiring the land because of confrontations with farmers. Betel leaf farmers have acrimoniously held up a $12bn project of the South Koren steel giant POSCO in Orissa, occasionally kidnapping their officials. The Maha Mumbai project, promoted by the Indian tycoon Mukesh Ambani, which was proposed to be the country’s largest special economic zone covering 10,000ha, has been stalled indefinitely for similar reasons. Chandrajir Banerjee, the director general of the Confederation of Indian Industries, says the problem of land acquisitions “will badly affect industrial development and overall economic growth in the country”. Industrial units are expected to create millions of badly needed jobs for India’s teeming millions, and could bring billions of dollars in foreign investment. Between 2006 and 2008, India’s farm sector grew by just 2.3 per cent, and grain production remains stagnant. Low crop yields, high interest rates charged by unscrupulous lenders and competition from farmers employing more advanced methods have caused nearly 200,000 peasants to commit suicide in recent years in India’s south and west. The farm sector accounts for only 17 per cent of India’s GDP, while the industrial sector contributes 29 per cent. Acquiring prime agricultural land for non-agricultural purposes could spur a food security crisis, analysts say. Between 1990 and 2003, 2.1 million ha of agricultural land have been used for non-agricultural use, according to government statistics. This land could have fed millions of India’s hungry. 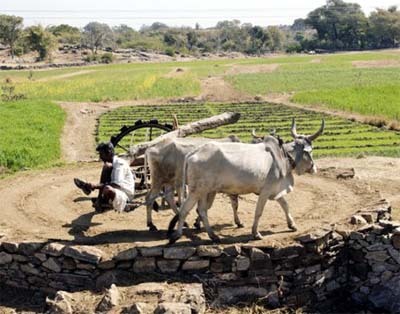 The government is expected to initiate changes in the country’s archaic Land Acquisition Act to settle issues of procuring land from farmers. The new law would make it mandatory for companies to procure 70 per cent of land for industries at market rates, a move aimed at ensuring farmers are well compensated. In Mr Sisodia’s humble village, dirt roads remain pitted with bone-jarring potholes, water shortages are common, the power supply is erratic and the nearest hospital is 30km away. But residents cite the example of neighboring villages, where farmers in the 1980s sold large swathes of land to the state-owned NTPC, which supplies electricity to the rest of country. Ironically, local villagers still light up their homes with the dim light of kerosene lanterns. “This shows how hollow are the promises of these English-speaking industrialists,” says Mr Sisodia. But JP Chalasani, the chief executive of RNRL’s Reliance Power, says he is not giving up on his thermal project. The company has filed a petition to the supreme court, challenging the earlier verdict. On a recent morning, farmers gathered in the village square armed with bamboo batons, pitchforks and cattle prods. The mood turned belligerent when a man, claiming to be the agent of a lawyer representing RNRL, arrived and said the lawyer wanted to talk.